Those of us who like to try different coffees enjoy differences presented by the roasters, the types of roasts and the beans themselves. We like to try the coffee that comes from different regions, countries, or specific farms. As we grow in discerning flavors we begin to get more confident and specific in what we like and don’t like. Bottom line is that we like coffee and enjoy the adventure of tasting the flavor of the next cup. Land of a Thousand Hills was started to partner with coffee growers, coffee drinkers, coffee shops and churches to embrace a commitment to Community Trade and give back to the farmers who produce the coffee beans. They hope to use the coffee as a way to build community and connect people in a purposeful and tangible way. They care about helping people who live in one of the world’s poorest countries be empowered by being paid a fair living wage for their work. There are other things they do to help the farmers grow and develop and I would encourage you to check out their story and site. I’ll share more when we review their decaf. We brewed this coffee in the Clever Coffee Dripper first. It seems to have a spicy, citrus aroma. The acidity is mild and the body is light to medium. The flavor seems to stay on both the front half and sides of the tongue. The aftertaste is kind of spicy and chocolaty. Next was the Chemex coffee maker and deep roasted flavor comes out here. Kim liked this coffee paired with chocolate. It makes you think while you are drinking it because it is complex. There is something there that I can’t quite put my finger on, but I like it. Then we tried it in the French Press and the aroma is more pronounced. It really smells good when you grind the beans and pour the water into the press. The deep roasted flavor stands out the strongest of either brew here. My mind is working as I try to figure out what I taste. Kim thought it went well with cinnamon graham crackers and chocolate. I’m only a man, but I think she wants me to get her some chocolate! We also brewed this coffee in the auto-drip and liked it there also. I realized that we must have liked this coffee because it was gone in less than a week. I went to make some and all that was there was an empty bag. It was there and then it was gone, but it was a good coffee drinking experience. Two thumbs up. We received this coffee for free and offer objective feedback. 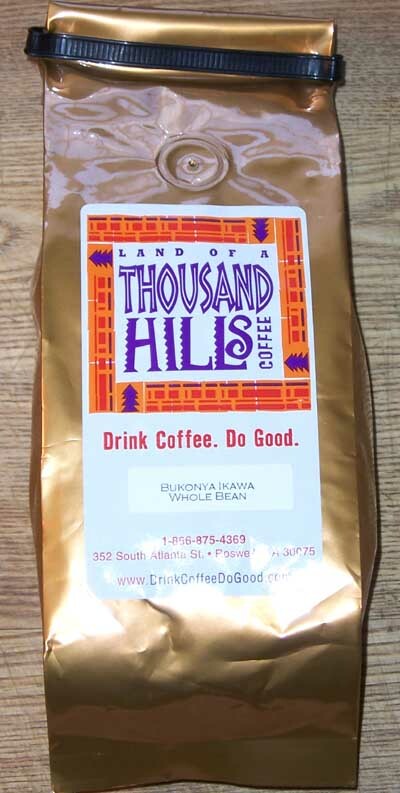 If you want to try a good Rwandan coffee and do good at the same time we suggest you try this Bukonya Ikawa. Until next time remember to stop and enjoy the coffee and conversation.